Gotta hand it to party chair Troy Price and the whole team at the Iowa Democratic Party. They have come up with a crafty and creative solution to a problem that seemed insurmountable: how to meet a Democratic National Committee mandate that caucus states have an absentee process, without triggering New Hampshire Secretary of State Bill Gardner's somewhat inscrutable standards about the difference between a "caucus" and a "primary" and thus prompting him to move his state ahead of Iowa on the calendar. The big picture plan, for those tuning in late, is a good one. IDP will offer a half dozen phone-in "virtual caucuses" in the final days before, and on, Caucus Night. Advance registration will be required, but anyone who wants to can sign up. The virtual caucus will let people cast a ranked choice vote (up to five). The virtual caucus votes will go into one pool at the congressional district level. If your first choice is non viable your vote transfers to your second choice, and so on, until you are in a viable group. The only way you "don't count" is if all five choices are nonviable or if you don't make all your choices. These Virtual Caucus votes will, under the draft plan, count for 10% of each congressional district's allocation (which I will discuss more in part three). The most interesting thing about this Phoning It In approach is that Iowa, after meeting with Gardner off and on for months, may finally have cracked his code. The word that makes a caucus into an election seems to be "ballot" - both marking one and qualifying for one. 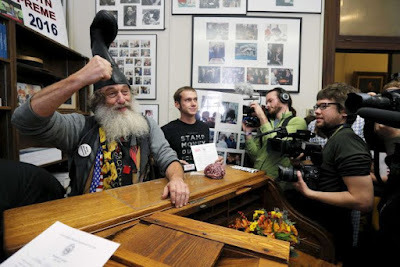 Political junkies (if you are reading this, you are) have all seen the New Hampshire primary filing pictures - state law requires the candidate, be it Hillary Clinton or Vermin Supreme (the very real perennial candidate pictured above), to file in person at Gardner's office. My sense is Gardner revels in this - and does not want a similar "filing" picture coming out of Iowa. Which is why it's being called "virtual caucus" and "non-present" and not "absentee ballot," and why the re-countable part of the in-person caucus process (another new DNC mandate) is being called a "preference card" and not a "ballot." My bet-the-beret bet is these preference cards will NOT be printed with names in advance, because that would imply that candidates "filed" and "qualified." I'm still not 100% convinced that Gardner will be OK with this - he plays his cards close to the vest and won't be Officially setting New Hampshire's date until as late as possible (current DNC calendars say February 11, 2020, with Iowa on February 3). He isn't saying, but initial reaction from others in New Hampshire has been positive. Only Iowa party activists, the delegate counters for the campaigns, and a handful of numbers-geeky national reporters (I'm thinking Steve Kornacki and maybe Chuck Todd) will care at all about delegate equivalents or realignment. The headline out of Iowa will be what the national press has always wanted and what Iowa Republicans have provided: the winner based on the first alignment vote count. The virtual caucus plan also addresses a concern I've heard and expressed for years: that a not-present process would turn Iowa into a "year long absentee chase" by the campaigns. The timeline to sign up is late and it is relatively short: January 6 to 17, with the first Virtual Caucus set for January 29. That doesn't address the nightmare scenario of the Caucus Night Ice Storm or the individual issue of a personal thing coming up - but neither does an election. You either make your plan and vote early, or if you wait till Election Day you take your chance. Once you sign up for Virtual Caucus, you can choose to call in for any one of the six - but you CAN'T change your mind and attend in person instead. That's part of why the last Virtual Caucus is scheduled to coincide with the in-person caucus, so people who change their mind and show up will still have one last chance to call in. The late dates also address a concern unique to the presidential nomination process: last second changes in the field of candidates. A lot of California early voters will cast ballots for people who will drop out before that state's primary day. (Of course this can happen to early voters in regular elections, too, says the guy who voted for Nate Boulton on the first day of the 2018 governor primary.) Past caucus cycles have seen people drop out at the last second, and a late schedule (along with ranked choices) minimizes that factor. These new options will require some earlier deadlines. Virtual Caucus participants will have to be registered Democrats by December 31, before signing up for the Virtual Caucus itself during the January 6-17 window. That's stricter than Iowa election law, but not bad compared to deadlines in other states (New York independents had to re-register months before the primary). And people registering or re-registering later, as late as Caucus Night itself, will still be able to caucus. They'll just have to go in person. The single biggest difference will be in the realignment stage. Only people in the under 15% non-viable groups will be allowed to re-align. Once you are in a viable group, you are locked in. And you can go home. Keeping all the cats herded until re-alignment is final is one of the most frustrating pieces of the caucus, both for attendees and for campaigns. This is not quite the Iowa GOP's "show up, vote, and leave," but it's a small step in that direction. I had a bad experience with this in, of all years, 2012. That was at the height of Occupy, who were caucusing Uncommitted against Obama, and I knew it would be rough when I was challenged for chair, and almost lost. We had an odd number of delegates and a standoff for the last one. Uncommitted filibustered until a couple in the Obama corner announced that they had to go home to relieve their child care - and we may have been the only precinct in the state that the president lost. So that tactic is gone, and so is the Old Bank Shot routine: "loaning" a candidate a few supporters as a strategic move to screw a third candidate. That's how Martin O'Malley won his lone Johnson County delegate; Team Hillary sent over a couple people to make him viable and to deny the delegate to Sanders. Caucus night horsetrading has declined in recent years anyway. Historically, the prize for cutting a deal was the delegate seat. "I'll join Team X if I can be the delegate." When the caucus crowd was mainly party regulars, it was easier for a precinct captain to broker that deal and get the group to go along. But with increased attendance, increased campaign intensity, and more new faces, people are less willing to make that deal: "I've been with Hillary from the beginning. I want the delegate to be a Real Hillary Person and not this dude who just came over from O'Malley." Party regulars may or may not like these tactics. But the new faces, who would rather just cast a secret ballot and go home, HATE them. My sense is that this change is not being made to stop horsetrading. A true savant might still be able to read the room and stash a few people away in a weak group, but you risk locking your people into an accidentally viable group. All seven delegates were allocated: Obama had four, Edwards had two, and Clinton was hanging on to viability with one. The Dodd and Biden and Kucinich people had moved, but there was still a Bill Richardson group about three bodies short of viable. The Richardson people kept demanding more time and kept begging people to move - but it was not to anyone's advantage. To give Richardson a delegate, someone else would have to give one up. This wasted about 45 minutes, during which a Richardson supporter kept screaming "Democracy takes time! Democracy takes time!" while the three viable groups tried to keep their people, not from defecting to Richardson, but from going home. So all of this is good. People who can't attend can participate, New Hampshire is mollified for the moment, and in at least one big way things will move faster. But there's still one piece to the plan that needs some work, as we will see in part three.